#GivingNewsDay – Triple your impact today! Today is #GivingTuesday, or as we like to call it, #GivingNewsDay. #GivingNewsDay is a national movement that celebrates honest, independent journalism and its supporters—people like you. Keep Nancy asking questions on your behalf. Donate now! Will you support our work by making a tax-deductible donation today? From now until Dec. 31, NewsMatch will match your new monthly donation 12x, or double your one-time gift, up to $1,000. On #GivingNewsDay every dollar you donate is tripled, thanks to NewsMatch 2018 and a challenge grant from the NancyOnNorwalk Board of Directors. For a limited time, your gift has triple the impact! Will you help? Every donation makes a difference, every donor matters. Please take a moment and join those who value the investigative news that NancyOnNorwalk brings to our city. Thank you! If you’ve already donated, please reach out to a friend and ask them to help us out. If you’ve been waiting to donate, do it now! Any amount will make a difference, and all donors count. All donations are tax-deductible. As a non-profit newsroom, we prioritize truth over profits. 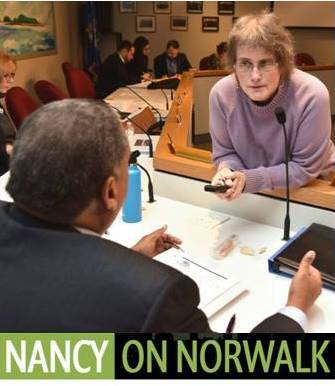 Your support today will go a long way toward keeping Nancy on Norwalk’s light shining on our fair city. Norwalk’s stories need to be told and they will be—thanks to people like you. …and the rest of the NoN team.